Hi Elaine,Just to begin with a million thanks to your amazing knowledgable self. I’m delighted with how everything went with the labour and put it all down to Yoga this time as i didnt get to exercise as much this pregnancy with the weight of the bump causing strain on my pelvis. Our second Baby arrived into this beautiful world Wednesday Morning December 21st weighing a massive 8ibs 12 ounzes. Another fast and intense labour with a total of 1hr 4 mins from the time we arrived at the hospital to the birth of our Amazing Little Man Bobbi. After experiencing such a natural birth on my first pregnancy i couldnt wait to get back doing pregnancy yoga when we found out we were expecting our second little bundle. All the yoga helped immensly during my first labour and evwn more so on my second and i couldnt recommend it enough to anyone who asked. Anyway, Tuesday night i got into bed about 12.30 pm . I was term plus 5 at this stage. I lay down in bed as normal and tossed and turned and before time i realised i just wasnt comfortable but this was to be expected this late in pregnancy. At 1.30 i had a feeling something was about to happen and decided to get up and take a shower. I proceeded to do so then woke Allan and said i think im about to go into labour to which he asked ” are you sure how far are the contractions apart ” ? These same contractions i was longing for all week just to be home in time for xmas 😥😂 how i was eating my words as soon as they did arrive lol. I said to Allan i havent had a contraction yet but i just feel pressure and feel i need to go . Allan phoned his parents to come stay with Belle while we made our trip to the hospital. Allans parents arrived to our house at 1.50 and just as they arrived i had my first along awaited for contraction. Let it be said .. be careful what you wish for. How quick did i forget what a contraction felt like and it only last year i experienced my first birth. We phoned the hospital to say we were on our way. The contractions were hot and heavy and were only 1 min and 30 seconds apart and lasting 40 seconds like . Lets just say it was an eventful car journey and Allan hit the roads in spots to Kilkenny. We arrived to hospital and checked into labour ward at 2.45 to which i had a contraction infront of the midwife so she brought me straight down to get checked. I was 4cm dilated and the intensity of the contractions was rapid. I got straight onto the ball and bounced and did hip rotations etc. I used all my yoga techniques to control my breathing for every contraction and i honestly cannot recommend the power of breath enough. My waters broke then and i was 6 cm. I then felt i needed to get up onto the bed and get comfortable on all 4’s. Exactly the same way i did when having our first born. I found myself doing more exercises on the bed to battle with each contraction and within minutes i felt i was at the pushing stage so asked the midwife to check. This been the so called “transistion stage” where you start to doubt your ability for whats ahead and think you cant do it. If you get past this stage you are sailing. Its just a mental block and i experienced it the very same on my first labour. My midwife was amazing as was my husband (again) and kept encouraging me to keep going and i did so just like my first labour with no pain relief again. My midwife then confirmed i was fully dilated and that this baby was coming fast. Baby Bobbi was born after 3 big pushes. 3 intense pushes but i knew the end was in sight. After the first push my midwife explained the next push would deliver babies head do i focused on that and waited until my body urged me to push. 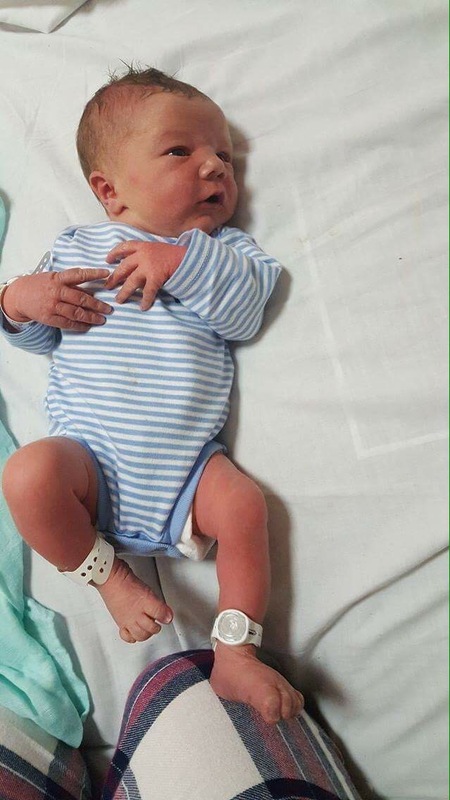 Soon as the head was delivered i knew the body would follow next and the 3rd push seen our beautiful Baby boy be born at 3.49 am weighing 8ibs 12 ounzes. A massive step up fron his big sister who at birth weighed 6ibs 15. We got to do skin to skin for a few hours as the hospital here is full and we were awaiting a room which to my delight was amazing. Bobbi took his first feed there for 30 mins and has been a dream latching ever since. The midwife told us afterwards it was a total of 1hr 4 mins from the time we arrived until delivery which was just sureal. While it was fast it was very intense. She joked to my husband that he will be delivering the nexy baby at home himself. Sincere thanks for all your advice and knowledge over the last few months and we cannot wait for Mama and Baby Yoga.